Until recently there were many proprietary mesh solutions, but because they are proprietary device of different vendors cannot interoperate. Only very recently the Bluetooth Special Interest Group has release the Bluetooth Mesh specification. This open mesh platform utilizes the power of Bluetooth 5 to create the best mesh ever. DPTechnics is one of the first companies who will offer a complete Bluetooth 5 Mesh platform. The Mesh Gateway runs on the proven IoT-modem and runs applications such as smart lighting, sensor networks, wall switch networks, etc. 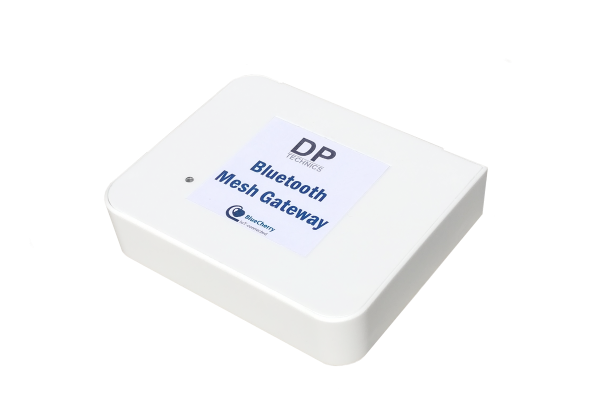 Discover the power of Bluetooth Mesh and contact DPTechncis for more information. DPTechnics expects the gateway to be available early 2019. The standard Bluetooth Mesh ensures the gateway will operate with tons of divices from different vendors. Not limited to a small number of nodes, but connect more than 32768 nodes into a single mesh network. No more popcorn effect when transmitting commands, but fast communication. The Bluetooth Mesh incorporates bank grade security through hardware 128-bits AES encryption on every single node in the mesh. Many proprietary solutions still use unencrypted traffic to send data and are thus inherently insecure. On top of the Bluetooth Mesh security the gateway also uses secure internet protocols such as SSH and SSL to make a connection to external services. The Bluetooth Mesh gateway runs all the DPTechnics libraries and BlueCherry services. This means it now becomes easy to implement Bluetooth Mesh compliant solutions and have a short time to market. We will use this Bluetooth Mesh gateway in our 1-2-3 product design service, so don't hesitate to contact us and start your smart mesh project. In the past Bluetooth was associated with short range but Bluetooth 5 changes al this. By using more sensitive RF frontends the range now defaults to over 100 meters for Bluetooth 5 low energy. If you combine this with mesh technology, the range becomes virtually infinite. Want to learn more about the Bluetooth Mesh? Send us an email.